Welcome to the Bookshelf, where I will post commentary on the books I'm currently reading. I have over 150 books at home and on my Kindle that I haven't even begun yet, so this page will give me motivation to get through them - eventually - hopefully. Would love to hear your thoughts on these. It'll be like our own little book club, except I get to pick the books every month. Isn't that every book lover's dream? I’ve been reading Sarah Bessey’s blog probably for a year or so now. She is one of those writers who makes you want to be a better writer… or worse yet, she makes me want to write like her. Bessey has a way of using prose to sound like poetry. Her voice emanates genuine compassion, humility, humor and love. So when I heard she was writing a book about being a “Jesus Feminist,” I thought this is something I need to read. 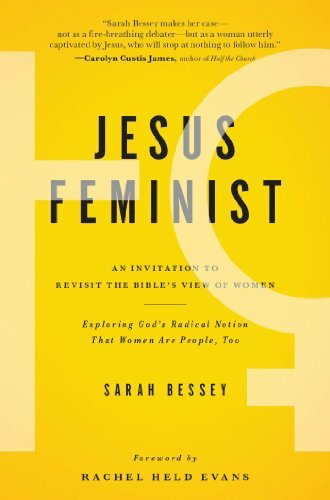 Thanks to NetGalley, I was able to review her book, Jesus Feminist: An Invitation to Revisit the Bible's View on Women, prior to its release date. The book weaves in and out of discussing the difficult parts of the Bible that evangelicals have used to paint women as less than men, along with moments in her life that helped her develop a sense of self as a female Christian. For info on Sarah Bessey's community sourced book launch, click on the photo. She encourages herself (and therefore her readers) over and over to come to situations of contention and disagreement with humility and love. She makes a confession of sorts that she will no longer “desecrate beauty with cynicism,” that she works on being gentler, patient, and less critical of others. She understands not everyone who follows Jesus will take to this Jesus Feminist idea, that all women are of equal importance, value and worth as men within the Kingdom of God, but she recognizes that focusing on that difference will only continue to divide the Kingdom instead of keeping us all on the path God intended. She makes a bold statement that “Patriarchy is not God’s dream for humanity.” When I read that I wanted to scream it out loud right along side her. One example Bessey used was when Mary of Bethany was listening to Jesus speak while her sister Martha was preparing food. Mary sat at Jesus’s feet by herself to learn from him. This was not something women did back in first century Judaism. Yet, when Martha got flustered because she was working by herself in the kitchen, Jesus told her she should be more like Mary. Jesus wants women to learn about God just as men do. Jesus wants women to be disciples who can then go forward and spread the Gospel to all corners of the earth. We’re all in this together: men and women. Bessey spent a good deal of time speaking about her own personal experiences as a woman, daughter, wife and mother. I’ll be honest; I did not expect to bawl my eyes out reading this book. But when Bessey described the tragic experience of her miscarriage it brought back so many memories of my own, still fresh in my mind from a little over a year ago. She opened up her heart and poured it out on the page for all to read. What tore me up in the end were the words “You are loved. You are not forgotten.” I needed the reminder that through my tragic loss, God is still with me, walking through the pain, holding my hand. It never goes away, although overtime it tends to hurt just a little less. In then end I found the book is a wonderful mixture of Bible interpretation, critical thinking on theology, the relevance of personal experiences, and some amazing pieces of poetic prose. It reveals being a “Jesus Feminist” comes down to learning who God created us to be as a women, and being able to be who we are with confidence. God gives us all gifts to share with others. Sarah Bessey’s gift is writing. She's created this book to share her ideas with the world just like thousands of people before her. Bessey recognizes that even though women have been denied the same rights and worth as men for centuries, women should be confident in whom God created them to be as women, and that Jesus Christ values them no matter their experiences/background. She says “our acceptability as women before God is not dependent on our husbands or fathers or lack thereof.” All women have a role to play in the Kingdom. All women have value. Yet she also recognizes that both men and women are called to serve one another in mutual submission, so recognizing our value and worth does not take away from our responsibility to love and care for one another. Thank you to Sarah Bessey for being a voice for so many women who have never been told before that their voice matters. I hope this book will help Christians, especially, rethink the role of women in their churches, in their roles as wives, mothers and daughters, as well as just every day people, trying to live their lives and professions in a still very male-dominated world. Would you consider yourself a "feminist" or a "Jesus-Feminist?" What does the term mean to you?